Earlier this month, Warner Bros. brought its upcoming summer action-thriller The Man from U.N.C.L.E. to Comic-Con, where they debuted a new trailer in Hall H. With less than one month until the August 21 release, the studio has released a slew of new photos from director Guy Ritchie's action-thriller. The images feature new looks at stars Henry Cavill (Napoleon Solo), Armie Hammer (Illya Kuryakin), Alicia Vikander (Gaby Teller) and Elizabeth Debicki (Victoria Vinciguerra). Set against the backdrop of the early 1960s, at the height of the Cold War, The Man from U.N.C.L.E. centers on CIA agent Solo and KGB agent Kuryakin. Forced to put aside longstanding hostilities, the two team up on a joint mission to stop a mysterious international criminal organization, which is bent on destabilizing the fragile balance of power through the proliferation of nuclear weapons and technology. The duo's only lead is the daughter of a vanished German scientist, who is the key to infiltrating the criminal organization, and they must race against time to find him and prevent a worldwide catastrophe. The supporting cast is rounded out by Jared Harris, Hugh Grant, Luca Calvani, Daniel Westwood, David Menkin and soccer star David Beckham. Guy Ritchie directs from a script he co-wrote with Lionel Wigram, who produced the director's Sherlock Holmes films. The director and his co-writer also serve as producers alongside John Davis and Steve Clark-Hall, with David Dobkin serving as an executive producer. The Man from U.N.C.L.E. will go up against Universal Pictures' biopic Straight Outta Compton and The Weinstein Company's Underdogs on August 14. Warner Bros. had originally given the adaptation a January 2015 release date back in 2013, before pushing it into the summer months last year. The studio hasn't announced any plans for a sequel as of yet, but it's possible that a follow-up may move forward if The Man from U.N.C.L.E. makes a big splash at the box office. 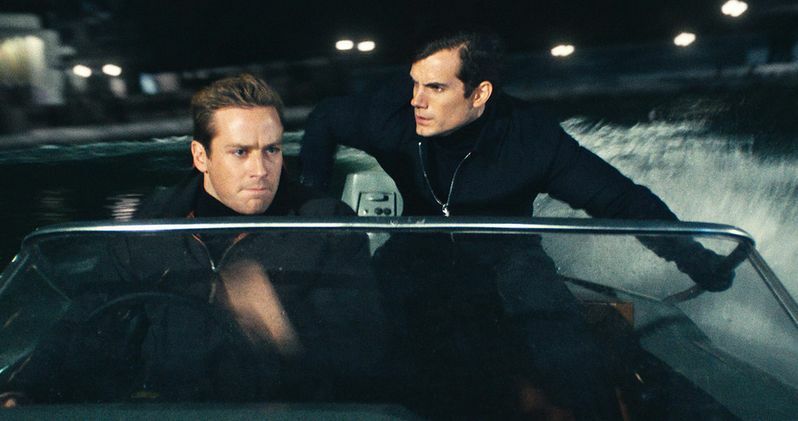 Check out the latest photos from The Man from U.N.C.L.E. below, and let us know what you think of this adaptation, based on the hit 1960s TV series of the same name. Could this be this summer's last big blockbuster? Or will audiences pass on this Cold War thriller? Let us know what you think, and stay tuned for more updates on The Man from U.N.C.L.E..